Skin tags are simply benign tumours that form lumps on the surface of the skin. They are normally a close colour match to the patient's skin tone and can appear anywhere on the body. Often forming in small clusters, skin tags can also be found in singular lumps. They are more commonly found as people reach old age due to excess collagen that gets trapped inside thick parts of skin, generally around areas that rub. Where are skin tags most commonly found? 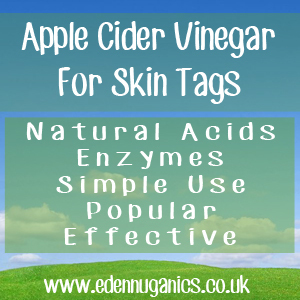 How is apple cider vinegar useful for Skin Tags? Apple cider vinegar works as a powerful, fully natural treatment for skin tags that can remove them completely within a week, and the best part is the process is completely pain free. The natural acids in the apple cider vinegar destroy the tissue that forms the blemish, leaving the surrounding skin undamaged during treatment. For this treatment there are a few things you are going to need, the first is a bottle of raw unfiltered apple cider vinegar. Be sure to only purchase unpasteurized ACV when using for health purposes. As well as this you will also need some cotton wool or pads and medical tape. The first thing we need to do is cut a cotton pad down to size. This can be tricky as the pad should only cover the skin tag and not much of the surrounding skin. Once the pad has been cut to size, it's time to soak it in vinegar. The cotton pad will soak up too much vinegar initially so it's a good idea to squeeze out the excess before applying it to your skin tag. The third step is to cover your tag with the cotton pad and secure in place using medical tape or a plaster. This process should be repeated daily for around 5 - 7 days. Over this time your skin tag will harden and turn a darker colour before finally dropping off with no pain what-so-ever! Overweight - Skin tags are most commonly found around areas of skin that rub together, these leave obese and overweight people far more likely to suffer from these blemishes. Pregnant - It has been noted that pregnant women are far more likely to suffer from skin tags due to higher levels of collagen in the skin. Diabetes - A number have studies have shown people suffering from type-2 diabetes to be more susceptible to skin tags. Warts - Warts are caused by the human papilloma virus and people suffering from HPV are often more prone to skin tags. Steroid use - Body builders who use steroids to increase their muscular structure may have a greater chance of developing skin tags. What is the difference between Skin Tags and Moles? Although moles look similar to skin tags, they are often darker in colour than the skin of the patient. One of the major differences is that skin tags are always benign where as moles can sometimes develop into melanoma; a type of skin cancer. What are skin tags? What causes skin tags?